Images from the ICAMS article Morphologies of small droplets on patterned hydrophobic substrates by N. Moradi, M. Gross, F. Varnik, G. Zikos and I. Steinbach have been chosen for the front cover of the June 2011 issue of Modelling and Simulation in Materials Science and Engineering. For situations, in which the size of a droplet is comparable to the roughness scale of the solid substrate, we explore possible wetting morphologies on patterned hydrophobic substrates and investigate their dependence on the initial droplet position, droplet volume and the surface geometry. For a regular array of cubical pillars, small perturbations of a symmetric droplet state are restored by capillary forces. Larger deviations, on the other hand, may lead to completely new morphologies. Our studies also suggest that the previously reported reentrant transition upon quasi-static evaporation (a transition from the suspended state to partial penetration and then back to the suspended state) (Gross et al 2009 Europhys. Lett. 88 26002) is not restricted to a symmetric initial state but may occur for quite non-symmetric morphologies as well. In contrast, a change in the substrate geometry may lead to a completely different behavior, fully precluding the reentrant transition. This underlines the importance of substrate design for the use of reentrant transition as a self-cleaning mechanism. 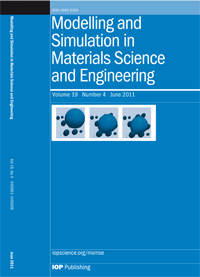 Front cover of the June 2011 issue of Modelling and Simulation in Materials Science and Engineering. Images are taken from an article by the ICAMS researchers N. Moradi, M. Gross, F. Varnik, G. Zikos and I. Steinbach.